The theme for the current Lawn Fawnatics challenge is fun folds. I created a free standing pop-up card for the challenge. It's been a while since I made one of these fun designs! 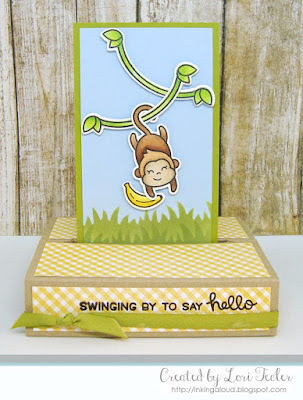 My image panel uses stamps from Lawn Fawn's Love Ya Bunches set. I colored them up with Copic markers and cut them out with the matching dies, then used foam tape to arrange them on the light blue cardstock panel. The grass was created with a stencil and Shabby Shutters distress oxide. The distress oxide ink really blends and covers nicely on the colored cardstock! I matted the small scene on green cardstock and set it aside while I created the base from a piece of kraft cardstock. With just a few scored lines, made with the help of my ScorPal, and some ScorTape, the base came together easily. I dressed it up with some yellow gingham patterned paper adhered to each section. I stamped the set's "swinging by to say hello" sentiment on one of the gingham pieces before adhering it to the base. A piece of coordinating green twill was tied beneath it as a fun accent. I added in the scene, securing it inside the base with the strips of ScorTape. The base will fold up flat with the scene tucked inside so it's both easy to mail and easy to display. Ooh what a clever design! I love how the monkey stands out! Thanks for joining us over at Lawn Fawnatics!